Superoverlay is a stand-alone Google Earth application for tiling raster datasets and creating view based regions in KML or KMZ files. Also Superoverlay can generate world files for all images in ArcView style (jgw, tfw,...). 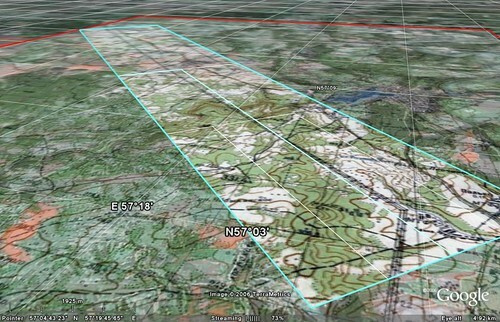 It helps you put large image overlays into Google Earth (for example alternative maps or aerial photography). GE Sky mode is supported. You can uses Superoverlay for public large images as professional addition to standard Overlay feature. 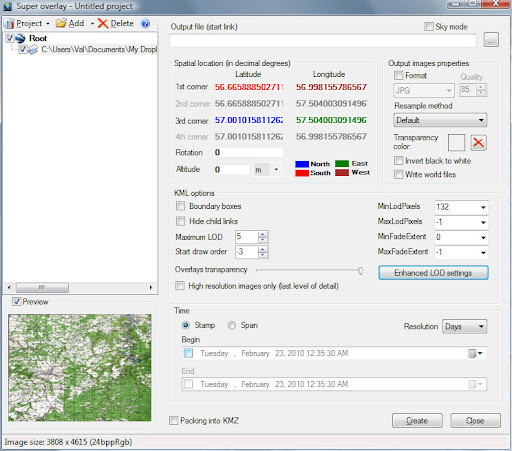 Superoverlay automatically include georeferences from world files, change and optimise size and time of downloading images. More info about Superoverlay see in Docs. New: Superoverlay standard is "KMLer Aware" version! If you have KMLer PRO license, you can obtain Full (Standard) Superoverlay version now. If you are KMLer Pro user, you can create superoverlay projects directly from ArcGIS projects (see new KMLer version 2.0.4 or later, 'Create overlays' command). Superoverlay Plus include all features of base Superoverlay application and Selections by geometry... for selection area of interests to hi-res images by superoverlay generation.